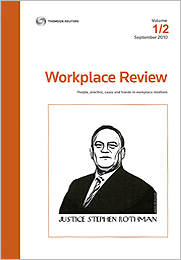 Pearson v Linfox Australia Pty Ltd  FWC 446 is an unfair dismissal case, examining the reasonableness of an employer’s decision to terminate an employee for repeated breaches of, and refusal to recognise, its policies. The refusal was based on the basis that it interfered with the employee’s perceived rights to free speech, and this case is instructive in construing the boundaries of an employer’s ability to give reasonable instruction, and considers the appropriateness and application of policies that may operate on employees outside of work hours. Solar radiation exposure is an inflight hazard, which whilst rare in normal latitudes exposure, can be significantly increased in the polar-regions. The legislative requirement for an employer to monitor the health of employees, where identified hazards exist, is beyond doubt and includes those which occur inflight. The High Court decision of Commonwealth Bank of Australia v Barker  HCA 32 held that the duty of mutual trust and confidence could not be implied as a necessary incident to the operation of all employment contracts. The importance of this decision lies not only in its departure from the reasoning of the Full Federal Court and preceding English authorities, but as a reminder of the proper confinement of judicial law making and the dangers of adopting cross-jurisdictional common law principles in an increasingly legislated arena. This article considers the different building codes implemented by the Commonwealth, New South Wales, Victorian and Queensland governments and the difficulties they pose for businesses in the building industry. The ownership of social media accounts and corresponding client contact lists in the employment context remains a hotly contested topic. Despite the emergence of the use of social media in the workplace, there remains an absence of a settled body of law from which to seek judicial guidance. This article discusses some of the key issues addressed by courts in Australia, the United Kingdom and the United States, and seeks to provide employers with some practical tips to help safeguard against potential loss and damage of client relationships, confidential information and intellectual property, in the digital age. For the pdf version of the table of contents, click here: WR Vol 6 No 1 Contents.